From left: TAC’s president Aliza Abrams, vice president Riva Preil, and Dr. Twerski. 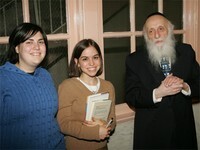 Dec 14, 2004 — Abraham J. Twerski, MD, an international authority on chemical dependency who is associate professor of psychiatry at University of Pittsburgh School of Medicine and former clinical director of the Department of Psychiatry at the city’s St. Francis Hospital, was the featured speaker at a Hanukkah dinner for students at Israel Henry Beren Campus, Dec. 13. Dr. Twerski is a frequent lecturer on a broad range of topics. The author of 31 books, he spoke at the Beren Campus on self-esteem, identity, and self-fulfillment. Some 200 students attended the event, which was sponsored by the Torah Activities Council (TAC), a Stern College for Women student organization, through the generosity of the President’s Circle, YU alumni who fund YU projects benefiting undergraduate students.